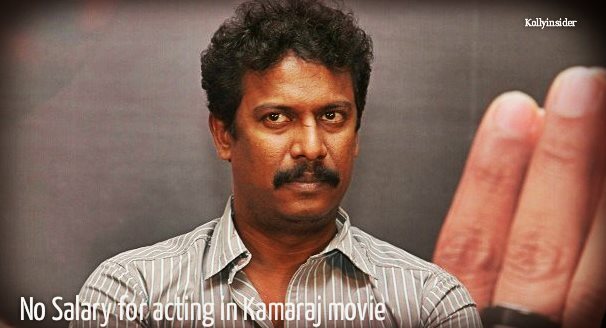 Actor Samuthirakani, who was roped in to play a key role in upcoming Tamil biopic "Kamaraj - The Kingmaker", didn't take any remuneration for his contribution the film as he wanted it to be a tribute to the great leader. "Kamaraj", which was originally released in 2004, has been digitally restored with a few additional scenes and will be re-released soon. "I worked free of cost but I don't consider it a big deal. It was my way of paying tribute to one of the legendary leaders of Tamil Nadu. I'm privileged to be part of this film," Samuthirakani told. The film is based on the life of Congress leader K. Kamaraj, former Chief Minister of Tamil Nadu. He was the Chief Minister for three consecutive terms 1954-63, and came up with the Kamaraj Plan that involved six chief ministers and six cabinet ministers resigning to do party work. The film features Richard Madhuram, Sambathraj Sumant, Mahendran, Vijaya and Charu Haasan in lead roles. Maestro Illayaraja has composed tunes for the film, which is directed by A. Balakrishnan.